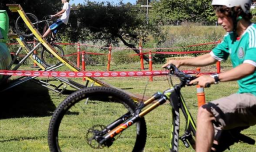 The two day Mountain bike festival in Santa Cruz aimed at revitalizing the downtown area was a full success with more than 3.000 visitors only on one of the two days. The sixth edition of the festival attracted many more families and cultural visitors next to the sporty young teenagers. The festival is run by volunteers so that all proceeds go back into Santa Cruz bicycling projects…Read more at Santa Cruz Sentinel.